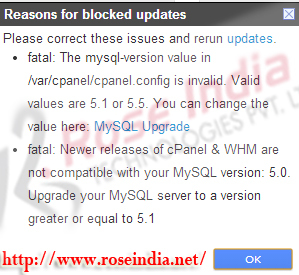 In this tutorial I will explain you how you can upgrade MySQL 5.1 to 5.5 through cPanel. If you can using the cPanel and not updated your MySQL 5.1 to latest version of MySQL you will find the error message "The last attempt to update to cPanel & WHM was blocked". After updating to MySQL 5.5 or above the error message will go away. 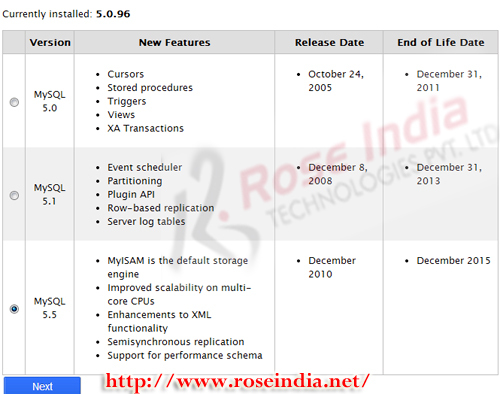 Learn how to update MySQL 5.1 to latest version MySQL Server (e.g. MySQL 5.5.23) through cPanel and make changes to the my.cnf file. 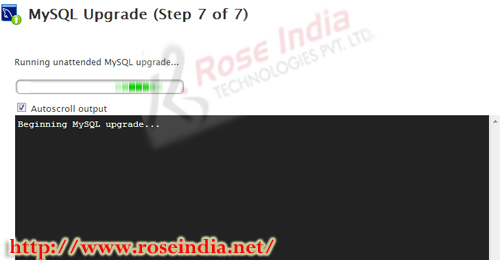 In this tutorial I will provide you step by step tutorial for upgrading the MySQL 5.1 to 5.5. The latest build of cPanel now supports MySQL 5.5 and use can use the cPanel wizard to upgrade your MySQL server 5.1 to 5.5. The MySQL 5.5 provides many features such as better performance, support for multi-core CPUs, fast service and so on. This feature of cPanel will benefits the end users as the MySQL server will be updated by the cPanel. 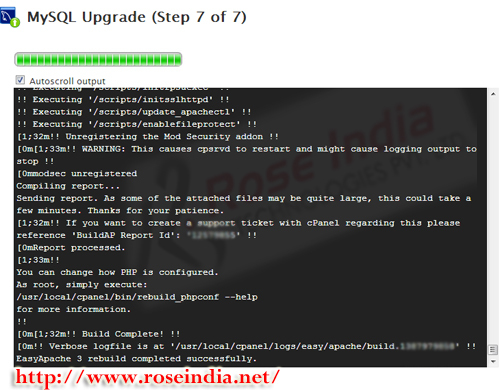 Here is the video tutorial of: "How to upgrade MySQL through cPanel?" Make sure that you should back up your database before proceeding with the process. As data is very important and you should take the complete backup of your data using mysqldump tool. There is no option of downgrading the MySQL 5.5 to lower version of MySQL. So, you should take backup for for proceeding. 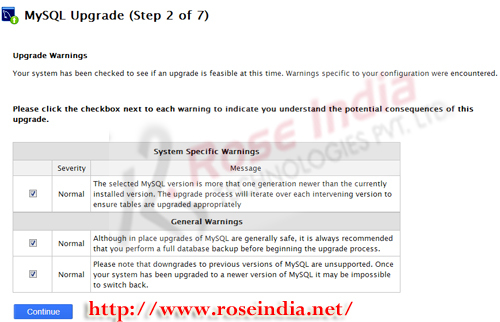 Here are steps to upgrade MySQL Server 5.1 to MySQL Server 5.5 through cPanel as root. and click on the "Next" button. Check all the checkboxes and click on the "Continue" button. After the upgrade we will login to server as root and then restart the MySQL Sever. If everything is fine mysql will start with this command. Starting MySQL.The server quit without updating PID file (/var/lib/mysql/xxxxxx.pid). If such error comes it means there is issue with the my.cnf file. The MySQL server should start. If you there is no error encountered during the process the cPanel upgrade process should modify the database make it compatible with MySQL 5.5 version. If some error is encountered and you don't have the data then you should restore from backup mysqldump tool. Now you should verify the application. 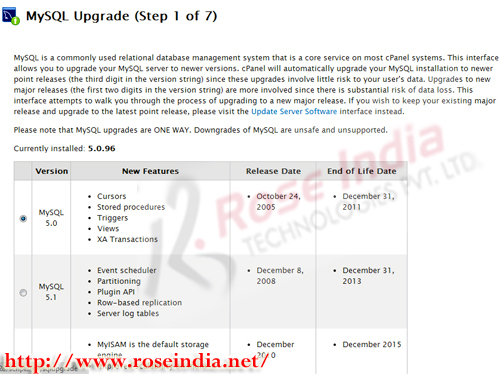 In this tutorial you have learned how to upgrade MySQL 5.1 to 5.5 using MySQL installer. Check more MySQL tutorials at our MySQL tutorials home page.